Many people know its summer when they pull their grills out. I know its summer when I find myself craving gazpacho, the Spanish dish that is—in essence—a garden salad in soup form. The classic Andalucían version of the dish is based on brilliantly fresh tomatoes together with cucumbers and sweet peppers bound together with bits of bread (often stale bread soaked in water) and olive oil, sometimes incorporating garlic and vinegar. After a lot of experimentation I’ve come to omit the bread. For me, the bread and water—no matter how traditional—dull the flavor of a dish that is all about how the freshest of ingredients crash against each other melding into a vibrant new flavor that is entirely its own thing. The dish, for me, is all about the freshest possible ingredients at their height. Nothing less and nothing more. Simple perfection. But I make my go-to gazpacho a lot in summer and find myself looking for something new to do with gazpacho while maintaining the essence of the dish I love. As always, it is great markets and the farms I go to for that search. Several weeks ago at the Mercado Hildalgo in Tijuana it was a tray of beets that reached out and grabbed me. They were gorgeous, more purple than red and they just asked to be part of my gazpacho. A foot away in one direction were some gorgeous yellow bell peppers, and a foot away in the other direction were some bunches of purslane (“verdolaga” in Spanish). I had my gazpacho and I had my garnish. Roast the Beets. Preheat the oven to 400° Fahrenheit. Cut the beets in half and wrap each piece in aluminum foil. Put the foil packets on a baking sheet and roast until soft, about 1 hour, turning once during the process. You can roast the beets up to a day before and refrigerate them overnight in the foil packets before peeling. Remove the beets from the oven and cool the packets until you can just barely handle them comfortable. 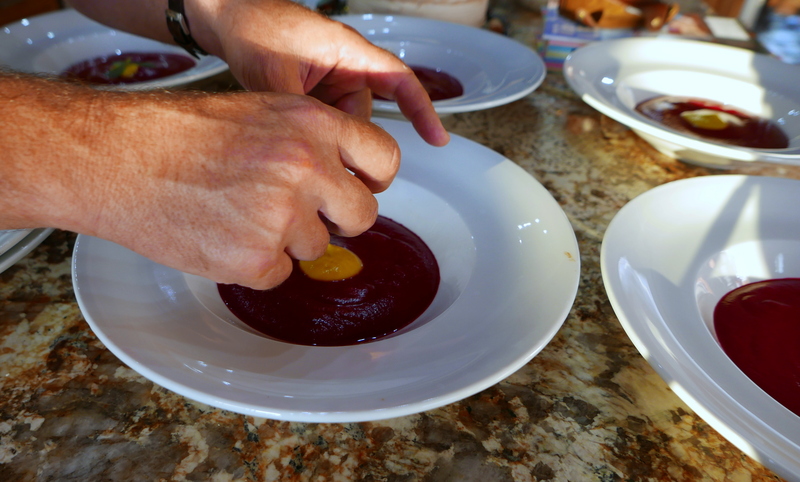 Open the packets and peel the beets (the peels should slip off easily). Cut the beets into chunks and let them cool completely. Pickle the Purslane. In a medium saucepan, heat the water, vinegar, sugar, and salt until just short of simmering, stirring to dissolve sugar. Meanwhile, place the purslane tips into a 1 quart sealable glass pickling jar. Pour the liquid over purslane, filling the jar to the brim. Seal the jar tightly and refrigerate until cool. Pickled purslane can be eaten immediately or kept for up to 2 months in the refrigerator. That is a good thing because you will have far more than you need. Roast the Yellow Peppers. Place the yellow peppers directly on the stove’s flame (or over an open or charcoal fire or blacken it using a blowtorch) and roast until the skin of the peppers are fully blackened. Place the blackened peppers in ziplock bag sto steam the skin free from the flesh, about five minutes. Peel the skin from the pepper using as little water as possible. Make the Yellow Pepper Purée. Place peeled peppers, vinegar and stock in the bowl of a Vitamix, other high speed blender or food processor fitted with the “S” blade and process to a purée, slowly drizzling in the olive oil. Clean the Vitamix/food processor. Purée the Cucumber. Place the chopped cucumber in the blender. Starting on the lowest setting possible, begin puréeing the cucumber, gradually raising the setting until the cucumber is completely liquidized. Finish the Soup. Add the sherry vinegar, olive oil and hot and process at the highest speed. Taste the soup and adjust the salt and vinegar balance. Also test for heat. If you want more heat add some more hot sauce. If you want a thinner texture, pass the soup through a fine mesh strainer. Place the soup in the refrigerator until chilled, at least half an hour.